Queseria La Antigua CB Tormes (LEB Silver) added to their roster experienced 34-year old American swingman Raymond Canady Jr. (201-98kg-84, college: Valdosta State). He played most recently at Al Salam in Saudi Arabian Division 1. In 20 games he had very impressive stats: 27.0ppg, 12.0rpg and 3.4apg in 2016-17 season. 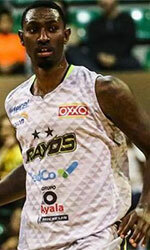 A very spectacular year in his career as he was named to Asia-Basket.com All-Saudi Arabian SBL Honorable Mention. The previous (15-16) season Canady played at Waves in U.S. semi-pro league UBA where in only one game he recorded 15 points, 8 rebounds, 2 assists, 1 steal and 1 block. Canady's team made it to the UBA Semifinals in 2012. He is quite experienced player. Canady's career allowed him to visit four different continents, while he played in eleven different countries. Canady tasted the life as pro basketball player in Europe, Asia, Latin America and of course North America. 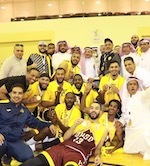 He has played previously professionally in Argentina, Australia, China (Guangxi), Colombia (Marinos de Bolivar), Israel (Hapoel Beeri), Malaysia, Mexico (Garra Canera de Navolato), Syria, UBA (Southern Generals, Cleveland Havok, Georgia Spartans, Georgia P. and Kentucky W.), United Arab Emirates (Al Jazeera) and Thailand (PK Aces). It's very possible he may end his playing career at Tormes. Canady is a former Eurobasket Summer League player, which is considered top summer league for players who want to play basketball overseas. He attended Valdosta State until 2007 and it will be his twelfth (!!!) season as a professional player. On Canady: Raymond Canady Jr.- 6'7 Guard/Small forward position- is very athletic and explosive with the basketball. Has NBA potential at the Guard/Small Forward. A creator on offense, great mid range game, can knock down open three's when needed. Also, strong defensive player, great rebounder, and strong finisher at the rim. website-http://raymondcanadyjr.weebly.com/.